It’s what we do sometimes when we want to seem bigger or more important in another’s eyes. “I know so and so” bolsters our reputation with someone else’s name. You never drop names that would hurt your reputation. In junior high, you don’t want to be caught hanging out with that kid. One day in school, I wore the same pants as that kid and there was no end to the mockery I endured. No, you don’t drop that name. You do whatever you can to distance yourself. You even go home and change your pants if you have to. At least, that’s how our fallen minds think, but it’s not how Jesus thinks. He is not ashamed to call us brothers (Hebrews 2:11). He is not above associating with those from whom we’d rather keep our distance. That’s good news, because the fact is, every one of us deserves to be shunned by God for our sin. Instead, Jesus associates himself with us and in so doing, makes us acceptable. 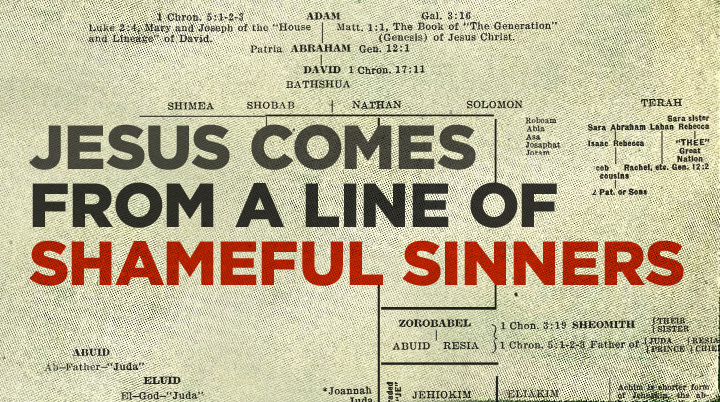 Jesus comes from a line of sinners, shameful sinners. Yet he is not ashamed to call us brothers and sisters. What can we learn from such a list of names? Matthew is clearly making a point in his genealogy: Jesus is the son of David, the son of Abraham (Matthew 1:1). Those are some pretty important names for Jesus to associate with. To any Jew waiting for God’s promises to be fulfilled, this was huge. Jesus is the long-awaited “offspring” of Abraham (Galatians 3:16), and the King who would rule forever on David’s throne (2 Samuel 7:14–16). But there are other names in this list that should stand out to us. Take Rahab for example. Matthew goes out of his way to mention that the mother of the admirable Boaz, was Rahab—the prostitute (Joshua 6:25). Yes, Jesus associates with the great king David, but also with David’s great-great-grandmother, a prostitute. Speaking of David, wouldn’t this be a great time—while listing Jesus’ family ties—to gloss over the shameful part of David’s story? Matthew doesn’t cover up any of it, essentially saying, what, you mean the part with Bathsheba, “the wife of Uriah” (Matthew 1:6)? Jesus associates with David the murder, Bathsheba the adulteress, and Uriah the victim. And then there was Rehoboam (Matthew 1:7, cf. 1 Kings 12:1–24), the hot-tempered, megalomaniac who couldn’t control his lust for power. As a result of this king’s folly, the whole kingdom of Israel was divided. How embarrassing. This is Matthew’s other point: Jesus comes from a line of sinners, shameful sinners. Yet he is not ashamed to call us brothers and sisters. He came into the world to redeem the worst, like Rahab, Rehoboam, you, and me. The notion of linking name-dropping, genealogy, and shame is inspired by Ed Welch in his forthcoming book from New Growth Press, Shame Interrupted: How God Lifts the Pain of Worthlessness and Rejection.